Crystal’s real-life stories of God’s love and strength through the adversities of her life’s sufferings are not only helpful, but also gives me insight into why God allows pain. Seriously God? After I’ve done everything I know to do? Seriously God? Are You still here? Or am I doing this alone? Seriously God? Is this really fair? Sometimes life suddenly changes and we are left with broken relationships and hearts, job loss, financial ruin, rejection, and other major life problems that might cause a crisis of faith. This devotional book follows the life of Elijah beginning with his simple prayer of faith to his courageous confrontation with the king with four sections including: God’s Got It Gotta have Friends Glimpses of Grace Go for Broke Crystal McDowell interweaves her own personal journey from brokenness to breakthroughs with clear Biblical teaching and encouragement for those who are asking Seriously God? 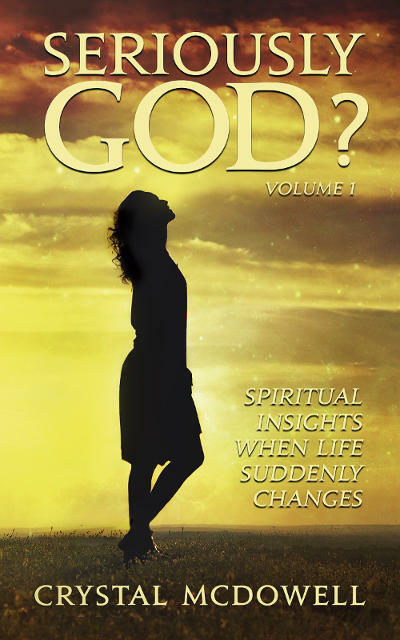 Crystal McDowell provides the backstory to her new book, Seriously God? Spiritual Insights when Life Suddenly Changes. This intro precludes the other sections of God’s Got It, Gotta have Friends, and Go for Broke. We know that God has the whole world in His hands…but do we believe that He has our situation under control? We can experience tremendous peace in the midst of great difficulty once we’ve settled in our hearts that God is in control. God blesses us with friends so that we don’t have to make this Christian journey all by ourselves. Instead of isolating ourselves in times of pain, we can experience the blessings of friendships through difficult transitions. God’s grace is His unmerited favor to those who belong to Him. His grace is more than enough to provide everything we need to make it through the tough days of the unknown. Have you ever been at that place of all or nothing with God? Sometimes you need to give it everything you have until nothing is left but your faith in God. He will never fail you.